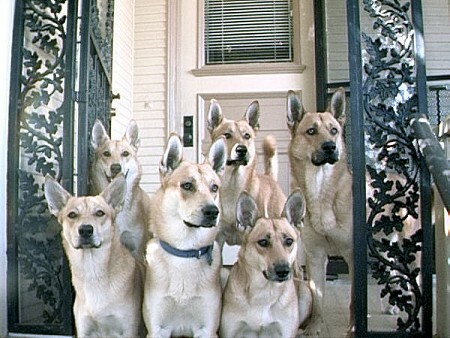 The Carolina Dog was first discovered in the 1970's. It's a landrace, which means that it has developed by natural processes by adapting to the environment where it lives. Today, the Carolina Dog is one of very few breeds still in existence that is a result of natural selection - developed to survive in nature - and not of selective breeding on our part. These dogs resemble types of dogs first encountered by Europeans near Indian settlements in this region, and have been depicted by paintings, drawings, and even rock art. According to the American Rare Breed Association, they are likely to be relatives to the first dogs that crossed the Bering landbridge into America from Asia together with the first primitive humans. 2,000 year old skulls and fossils are nearly identical with these dogs of today. These tests accompanied by DNA testing show a link, but there isn't enough evidence to prove the connection. While many of these dogs are extremely shy around people, they're also loyal to their human, and can be wonderful pets. They're gentle, social, and bond well with children. 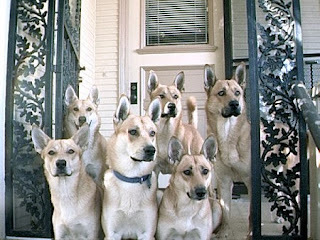 The Carolina Dog needs to be part of a pack, and integrates well into the family framework. They're not known to be aggressive by nature, but they do have a strong hunting instinct, and they're independent. If you want to know more about the Carolina dog, check out their pages at the American Rare Breed Association, at Dogbreedinfo.com, and carolinadogs.com.